Alongside the rich selection of wines on offer, we at Aquitaine Vinothèque also serve exquisite delicacies for you to either enjoy at our Bistro or take away. Wild boar pâté from Auvergne, rabbit terrine from the Pyrenees and mousse aux foie gras from the Périgord region, not to mention savoury goat and sheep cheese from Provence, are but a small sampling of the copious delicacies on display at our gourmet counter. Could it be that on your last trip to France you tasted an unforgettable cheese that you can’t find anywhere? 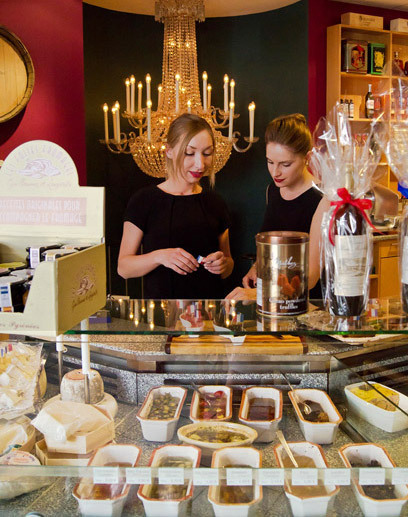 Swing by for a visit – we offer one of the largest selections of French cheese specialities in Maxvorstad. We know our suppliers through and through and select them very carefully. You’ll find only the very best quality products Aquitaine Vinothèque – and not with the most expensive price tag, something we attach great importance to. On request, we are happy to arrange individual gourmet pick-up platters for your event.